Hiring the right flooring installer is as important as choosing the right flooring material. The quality of flooring installation plays a great role in how well your flooring looks and how it performs over time. Selecting a highly qualified flooring contractor is the first step to ensuring long-term satisfaction with your new floors. Match the material to the contractor. While some flooring contractors may have enough subcontractors or employees on staff to be able to expertly install all types of flooring materials, most may not. Ask potential contractors which types of flooring they specialize in and ask if they have any certifications from manufacturers in the type of flooring you want. There also are trade organizations that offer accreditation, such as the National Wood Flooring Association. These relationships with manufacturers and trade organizations are a good sign that the contractor has the skills and training to do the job with a particular type of floor. How long a flooring contractor has been in business is important, but checking references is a better gauge of quality work. If a potential contractor hesitates to provide you with a list of his or her recent customers, move on to the next candidate — well-qualified contractors are glad to have you learn more about their satisfied customers and the work they’ve done. Get multiple bids for your project. Although it can be a hassle, take the time to get at least three estimates — in writing — for your flooring project. So that you can more easily compare them, make sure all bids include not only costs, but also start and completion schedules, detailed lists of all materials and all of the work that will be performed, details on how waste will be managed, who will be responsible for any equipment rentals, how and when payment is to be made, and how your property will be protected while the work is being done. As with references, if a potential contractor seems reluctant to provide information in writing that his or her standard contract doesn’t cover, think twice about working with that contractor. Verify all credentials and coverage. Licensing: Not all municipalities and/or states require licensing specifically for flooring contractors, but check to see if yours does and if the contractor has the necessary licensing. Liability insurance: Ask for the contractor’s proof of insurance, then verify with the insurance company that it’s current and has sufficient coverage for the work to be done. Some flooring installation equipment is very heavy, and can cause damage to your property or even injuries to the installers, so don’t skip this step while vetting contractors. Bonding: A surety bond protects you if the contractor does an improper job or doesn’t meet his or her financial obligations, such as paying subcontractors. Bonds may also keep you from being left responsible for taking care of unpaid debts that the contractor incurred. The requirements for bonding vary according to your location, so you’ll want to check with the authority in your area. Don’t have time to vet flooring contractors? We’ve done the work for you. 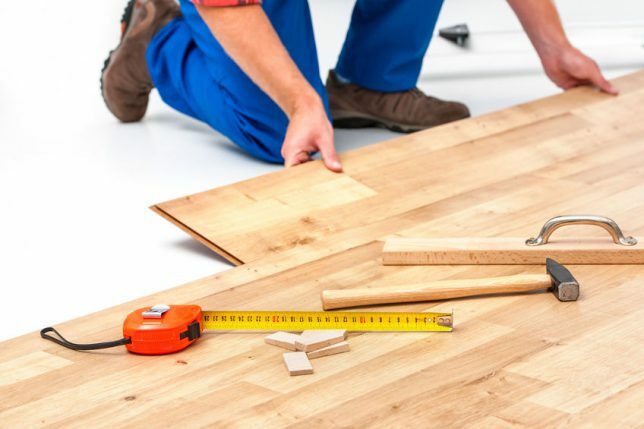 Contractor Connection makes finding an experienced and qualified flooring contractor simple. The flooring contractors in our network meet tough insurance industry standards and we’ve verified that they’re properly licensed and insured. Instead of calling multiple contractors, just enter your ZIP code at the top of the page and we’ll match you to just one contractor — the one who’s right for your flooring project.